Barzin, a Cana­di­an indie group named after its main and found­ing mem­ber, Barzin Hos­sei­ni, was found­ed in 1995 as a solo project, adding three new mem­bers between its found­ing and the release of debut album Barzin. 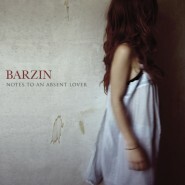 Rely­ing upon a dreamy, folk-infused aes­thet­ic, Barzin’s music has devel­oped over the last four­teen years into a rich­er sound, cul­mi­nat­ing in Barzin’s newest album, Notes to an Absent Lover, which, though it suf­fers from a gen­er­al lack of vari­a­tion, demon­strates the cre­ativ­i­ty behind the group. Although an occa­sion­al har­mon­i­ca or cel­lo will appear, Notes to an Absent Lover is oth­er­wise exclu­sive­ly per­formed by a fixed set of instru­ments. While this may have been help­ful while record­ing the album by allow­ing Barzin to focus entire­ly on a sin­gle, sim­ple set of instru­ments, the end result was sim­ply to assist the album in estab­lish­ing its extreme same­ness. Not only do all the tracks of Notes to an Absent Lover car­ry rough­ly the same com­bi­na­tion of instru­ments, but tracks addi­tion­al­ly share tone qual­i­ty, chord pro­gres­sions, and phras­ing, even as they attempt to remain unique by vary­ing tem­po and rel­a­tive instru­ment dynam­ic lev­els. In fact, one of the only tracks that is tru­ly dif­fer­ent is “Look What Love Has Turned Us Into,” which uses dras­ti­cal­ly dif­fer­ent instru­men­tal har­mo­ny lines along with a push­ing drum line that togeth­er man­age to coun­ter­act the assim­i­la­to­ry effect of hav­ing tone qual­i­ties sim­i­lar to every oth­er track. Hosseini’s vocals through­out Notes to an Absent Lover fit well with the melod­ic sound of Barzin’s music. Hosseini’s low, plain­tive tones ring out through the album, an odd­ly con­fi­dent sound and yet one which expert­ly evokes the emo­tion tight­ly wound around the album. As Hos­sei­ni tells the melan­choly tales that occu­py Notes to an Absent Lover, his invest­ment in what he’s singing becomes emi­nent­ly clear. Though Hosseini’s voice varies lit­tle over the album, slight vari­a­tion in vocal style between tracks pre­vents his voice from becom­ing dull - though on a longer album, insuf­fi­cient vari­a­tion might have become a greater prob­lem. Lyri­cal­ly, Notes to an Absent Lover cov­ers the well-trod­den ter­ri­to­ry of lost and unre­quit­ed love, but care­ful and cre­ative writ­ing pre­vents it from seem­ing clichéd. On some tracks, Hos­sei­ni crafts sto­ries, like that which begins the album in “Nobody Told Me:” “I awoke / In a stranger’s house / I did not feel / Like myself / I had come / To for­get / A pret­ty girl / With auburn hair / There’s no god in my blood / Yet she still remains” and on oth­ers, emo­tions like the wist­ful­ness expressed in “The Dream Song:” “It was a sim­ple dream I know / But it won’t go away.” How­ev­er, though Notes to an Absent Lover is gen­er­al­ly com­posed of good writ­ing, a ten­den­cy towards rep­e­ti­tion weak­ens it some­what, pre­vent­ing it from hav­ing the effect it should by all rights have. The main, most appar­ent char­ac­ter­is­tic of Barzin’s sound is warmth. This warmth infects every sin­gle track: slow, melod­ic, drum-heavy, repet­i­tive, and fast alike. Every track of Notes to an Absent Lover evokes relax­ing, fuzzi­ly pleas­ant images with lazy chords and clear, excep­tion­al­ly deep drums, even as the lyrics fol­low the theme implied by the album title. And while this seem­ing­ly large con­trast would gen­er­al­ly weak­en an album, Barzin man­ages to suc­ceed in blend­ing all aspects of the album well. Unfor­tu­nate­ly, this blend­ing does not cease between neigh­bor­ing tracks, or even tracks vague­ly near each oth­er. In fact, only one or two tracks on the album are eas­i­ly dis­tin­guish­able from the remain­ing mass of incred­i­bly warm, solid­ly built sound. So while Notes to an Absent Lover is cer­tain­ly a pleas­ant album, it is by no means musi­cal­ly diverse. In fact, one could very near­ly replace Notes to an Absent Lover with any sin­gle (were one to be made) from the album, and lose very lit­tle con­tent. In the end, what could have been a pow­er­ful album, giv­en some more thought, remains sim­ply mediocre.